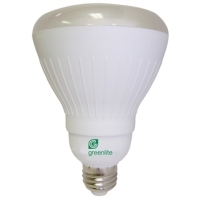 This 20 watt PAR30 reflector from Greenlite is suitable for use in indoor fixtures designed for use with PAR30s, which include most recessed downlight fixtures. With 820 lumens of light it is a suitable replacement for a 75 watt incandescent light bulb. Note: This bulb may have reduced rated life in enclosed fixtures or emergency exit lights, and is not suitable in outdoor locations where it would be exposed to the elements, or in conjunction with dimmers, photocells, or electronic timers. This lamp contains mercury. Please recycle at the end of its life.